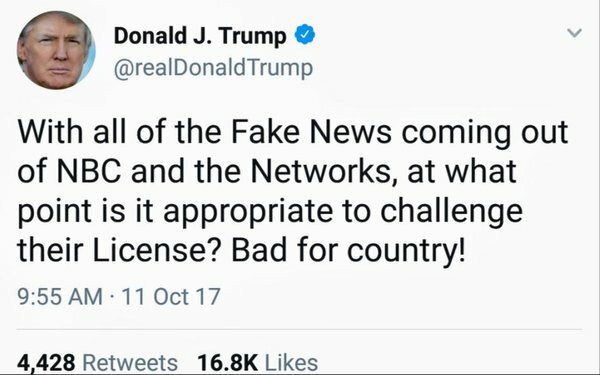 President Donald J. Trump has issued a not-so-veiled threat to NBC challenging the licenses the Federal Communications Commission issues for its local broadcast stations. The threat, which came in a tweet posted this morning, was the most explicit statement to date that the President of the United States wants to censor news coverage about his administration, raising the prospect of challenging a broadcaster’s licenses because it doesn’t agree with its coverage. The threat isn’t just another in a long litany of complaints Trump has made about the “fake news” coverage by mainstream media outlets such as NBC News, CNN and major newspapers including The New York Times and The Washington Post, but has teeth because Trump has sway over the commission, including appointing its commissioners. Trump, who declared war on mainstream news outlets during his first full day as President, has ramped up the rhetoric over his term, but this morning’s tweet is the first time he alluded to using the power of his office to retaliate against a broadcaster for coverage he doesn’t like. NBC owns 12 broadcast TV stations that are licensed by the FCC, including ones in the biggest TV markets. NBC affiliates that carry NBC News’ coverage are owned by other companies that also operate local broadcast stations licensed by the FCC. 29 comments about "Trump Refutes NBC News Story, Tweets Challenge To Its Broadcast Licenses". Ed Papazian from Media Dynamics Inc, October 11, 2017 at 11:53 a.m. The man is acting and sounding more irrational each day. Incredible. Steve Schiedermayer from Schiedermayer & Associates, Inc. replied, October 11, 2017 at 12:01 p.m. Pretty easy solution to lower the temperature - fact-check stories, don't be ideologically -driven, just report. Joe Mandese from MediaPost, October 11, 2017 at 12:12 p.m.
@Steve Schiedermayer: What makes you think they don't fact-check or are "ideologically-driven?" The story Trump cited had nothing to do with ideology. It was about him asking his military staff to increase America's nuclear arsenal 10-fold. More importantly, you think the solution for a broadcast news organization to avoid having its licenses pulled by the federal government is to report what the federal government believes it should report? Hope that's a minority view. David Reich from Reich Communications, Inc., October 11, 2017 at 12:19 p.m. So crazy. The whole idea of fake news from major broadcast outlets and major newspapers is ridiculous, but unfortunately many people believe it because trump keeps repeating it. Why not threaten licenses of the Sinclair outlets that are forced to run slanted editorials as part of their local news content? Now THAT's fake news. Joe Mandese from MediaPost, October 11, 2017 at 12:22 p.m.
@David Reich: Re. Sinclair, also transparently ideologically-driven. Not sure about their fact-checking. Steve Schiedermayer from Schiedermayer & Associates, Inc. replied, October 11, 2017 at 12:34 p.m.
Joe - kindly for you - please spell check - there's no such word as idealogically. Second point - Trump specifically disagrees with the assertions by the predictably unnamed "officials". He says it's fake. There's no way to really know unless the "officials" are brave, come out of hiding and go on the record. Kinda like they're doing on Harvey now. Joe Mandese from MediaPost, October 11, 2017 at 12:47 p.m.
@Steven Schiedermayer: Actually, there are ways to know. They are called facts, reliable sources, reporting, the truth, etc. If I understand your response, you are saying the fact that Trump says it's fake is sufficient? So I'll take it that you do think the solution is for broadcast news outlets to report what the federal government believes they should report? That being the case, no need to ask what the heck you mean by "Harvey." I'm guessing you don't mean the Hurricane, or the calm before or after it. David Scardino from TV & Film Content Development, October 11, 2017 at 12:53 p.m.
Joe, you give the President too much credit. Clearly he didn't know individual networks are not licensced by the FCC (though their O&O stations are, of course). Luckily, FCC Comsih Jessica Rosenworcel set him straight. You'd think a president and reality TV "star" would know such things, no...? Steve Schiedermayer from Schiedermayer & Associates, Inc. replied, October 11, 2017 at 12:58 p.m.
Agree totally, there are ways to know - but media has proven so frequently to be incorrect that we can no longer take what the media calls truth - to actually be true. Definitely don't think that taking what the government says to be immediately true is a good idea either. I ask myself if the "journalism" is agenda-driven or legit reporting. Paula Lynn from Who Else Unlimited, October 11, 2017 at 1:06 p.m.
Stan Valinski from Multi-Media Solutions Group, October 11, 2017 at 1:07 p.m.
More and more he is trying to make America a 3rd world country, Alex Jones is celebrated for his white supremists BS and NBC is demonized for good jounalism. The only source for his supposed high IQ is the liar in chief himself. Love to see him take up Mensa's offer but the cowardly blowhard would never take a fair test. Chuck Lantz from 2007ac.com, 2017ac.com network, October 11, 2017 at 1:13 p.m. When and where were you taught that any legitimate news media has ever declared their reports to be absolutely true? No mainstream media has ever done that. No legitimate news journalist has ever done that. That's why they call them news "reports." And anyone who can't see the immediate and very real danger when Trump threatens to shut-down a major news source simply because he doesn't agree with what it reports, becomes a small part of that immediate and very real danger. Joe Mandese from MediaPost, October 11, 2017 at 1:31 p.m.
@Steven Schiedermayer: Don't mean to pile on, but as a self-declared legitimate journalist I believe in setting the record straight. That's something other legitimate news organizations -- the ones @realDonaldTrump calls "fake news" -- including NBC News also take seriously. They do that by being responsible in the front-end of their reporting so they report the most accurate account possible. And they do it after the fact by setting the record straight if they do get something wrong. That's something I don't think many critics of "mainstream" news organizations understand, that they're not perfect, but their imperfection is part of an ongoing process of professionalism that is constantly striving to attain the truth. When you allege "media has proven so frequently to be incorrect that we can no longer take what the media calls truth," be specific, don't generalize, and don't characterize all news outlets that way. Because that is a "fake" allegation. The real problem with incredulous news is actual "fake news," which has been perpetrated by Russia, members and affiliates of the Trump campaign, and honestly, the administration itself. Not just in the bald-faced lies issued by the White House press dept, but in an actual "fake news" network: http://www.snopes.com/2017/08/02/trump-administration-real-news/ . Regarding your speculation that Trump doesn't understand the difference between licensing a network or its broadcast stations, I don't know that that's true, but it doesn't matter, because it has the same punitive effect. By the way, this is not the first time a POTUS has threatened to pull the broadcast licenses of a major media company whose news he didn't like. That one was Richard Nixon and the news outlet was Washington Post Co.
David Reich from Reich Communications, Inc., October 11, 2017 at 1:36 p.m.
Mike Cherepko from n/a, October 11, 2017 at 3:26 p.m.
"Refutes" connotes a level of evidence that Trump did not supply. "Disputes" would be more appopriate here. John Grono from GAP Research, October 11, 2017 at 8:54 p.m.
Joe and Steve, I am perplexed. By just one word. Steve you take pains to advise Joe that there is no such word as 'idealogically'. The thing is when you read the article and comments, it appears (and I stress appears) that Joe did not used the word (well non-word .. if that is a word) 'idealogically' but used the word 'ideologocally' which of course is a legitimate word. So, I have a question for both Joe and Steve. Joe, did you edit you comment posted at 12:12 to correct the spelling mistake? If not, Steve, did you misread Joe's comment of 12:12 when you made your 12:34 comment? John Grono from GAP Research, October 11, 2017 at 8:57 p.m.
And drat. Apologies for the typo 'ideologocally'. Joe, I still agree with Ed that a 'Preview' function for comments would be a great improvement. Chuck Lantz from 2007ac.com, 2017ac.com network, October 11, 2017 at 9:32 p.m. I sincerely hope that Mr. Scheidermayer is paying close attention to the convenient object lesson here involving a simple typo, and the efforts to fix it. It's a very good example of how journalism actually works, especially for those who believe that "we" all think that the media is inaccurate. Joe Mandese from MediaPost, October 11, 2017 at 9:35 p.m.
@John Grono: I corrected the word when Steve Schiedermayer pointed out the typo. Wish we had spellcheck in comments, and agree with you about preview function too. Joe Mandese from MediaPost, October 11, 2017 at 9:40 p.m.
John Grono from GAP Research replied, October 11, 2017 at 10:07 p.m. Thanks Joe. And lucky you - being able to go back and edit out typos. I think there is/was an Aussie newsletter that had a similar look/feel (which software are you using btw?) that allowed a pop-up editable preview window before the commenter commited to the post. Chuck Lantz from 2007ac.com, 2017ac.com network replied, October 11, 2017 at 10:08 p.m. Even the OED refutes this debate, sort of. Joe Mandese from MediaPost, October 11, 2017 at 10:12 p.m.
John, If the editor-in-chief (me) was also the CTO, many of the things we publish would have a different look and feel, including comments. For the record, we don't like altering facts in anything we publish, including comments, but typos are fair game. It does create some incongruities when people comment on the typos, but don't feel we have the right to edit that out of other posters' remarks. John Grono from GAP Research, October 11, 2017 at 10:32 p.m. I agree with a 'non-edit/allow correction' policy. Eons ago I had occasion to correct something that had already been published. I didn't know the journalistic procedure so I edited the original text and in brackets noted the word/phrase I had corrected using Latin. For example, in this instance this would have been something like "...ideologically (conrectus. - idealogically)..."
Does anyone know the correct journalistic procedure? Paula Lynn from Who Else Unlimited replied, October 12, 2017 at 11:03 a.m.
Bernadette Cognac from Kantar Media Research, a Division of WPP, October 12, 2017 at 7:45 p.m.
Let's just stop with all the comments arguing whether "ideologically" is a word, or whether Trump is competent. Mandese's article is spot on: to what degree is this President willing to go to silence anyone who disagrees with him or challenges his assertions? And will this President actually try to pull, by using the influence of his office over the FCC, the licenses of valid journalistic outlets (and yeah, "journalistic" is a word, I checked)? These are troubling thoughts. John Grono from GAP Research, October 12, 2017 at 9:58 p.m.
Bernadette, thanks for pointing out the error of our collective ways by posting comments about grammar, when we should be focussing on the degree that someone should have the right to silence anyone that disagrees with them. Chuck Lantz from 2007ac.com, 2017ac.com network replied, October 12, 2017 at 10:47 p.m.
John; Bernadette's comment was totally focused on the subject of the article. The only grammar lesson I saw in her post was a passing reference that simply underlined her main complaint, which was the real fear that Trump and his cronies are attacking legitimate journalism. And I'll add one of my own real fears, that is perfectly illustrated by this mini-debate over a minor detail amongst like-minded individuals. I've seen this happen far too often on the "non-GOP" side of politics, where battles are waged over relatively small details, all distracting us from the real fight we should be engaged in. And those we are fighting notice it, encourage it and love it. And why wouldn't they? They don't care how many flaws their political choices have, as long as the have a giant "R" behind their names. I'm not suggesting that we lower our standards, but rather that we make sure our infighting is over things that truly matter. As I've said far too often; ... we aren't starting a new religion when we select and support candidates or issues. Striving for perfection is very different from demanding it. Much ado about nothing? Maybe. John Grono from GAP Research, October 13, 2017 at 12:56 a.m. Apologies to one and all. First, I have just realised that for some reason my initial comment (in support of Joe's article) must not have been sent. The reason for my line of questioning is that I was curious as to the protocol when you have to amend something you have written. That has happened to me in the past and I was at a total loss. Maybe we put it down to frustration - or jealousy - that Australia is a long term ally and friend of the USA, but it appears that many Russians have had more say over the last election result than I got to have. (Please factor in that is Aussie humour). But seriously we are having some similar - but a lot less signifcant - issues here in Australia where some of our rights are being whittled away as individuals and some of the media. However our parliament seems to be largely ineffective at achieving any of their plans that their incomptence could be our saving.